A few weeks ago our next door neighbor went fishing and caught a bunch of salmon. He brought us a few to smoke. N smoked them with a lot of seasoning and a few of them are a bit over-seasoned. "No problem," I thought. "I'll just make a spread." I flaked half of a filet of salmon and then added 6 ounces of cream cheese and 4 ounces of crème fraîche to it until it was a spreadable but light consistency. N suggested adding green onion to the spread directly. 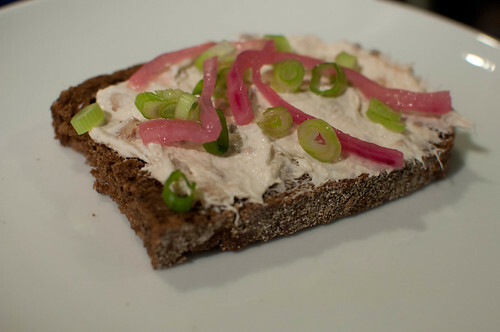 I decided against it in case the green onion would lose their crunch and I just served them on the side with some quick pickled red onion. It was pretty good on store-bought fresh-baked pumpernickel bread. While we ate all of the salmon spread, N grilled chickens. N brined two chickens overnight. He coated them in some hatch chile barbeque sauce I made* and then smoked them with a bit of mesquite. They took a bit longer to cook than usual for some reason. I threw together a quick, super-tart cole slaw (oops). I shredded the carrots and added them and they turned the entire batch a pale orange color. Not appealing! I did want it to be a bit tart to counter the slightly-sweet bbq sauce, but not THAT tart. After an afternoon excursion to Cabela's resulted in the truck being hit and our trip taking a bit longer than expected, I supplemented with some store-bought scalloped potatoes. Since the cole slaw was horrible and G doesn't like chicken, I'm glad I added the potatoes! 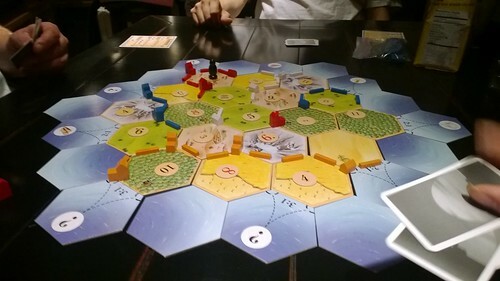 After dinner, G suggested we play Settlers of Catan again. I fear he will suggest it every week until he wins a game! 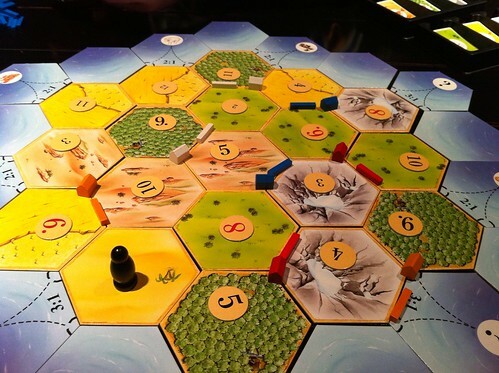 not more settlers of catan! 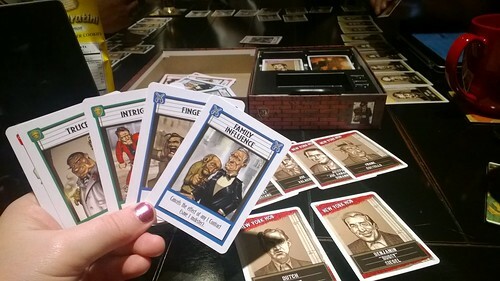 We played two rounds -- you won the first one, N won the second. 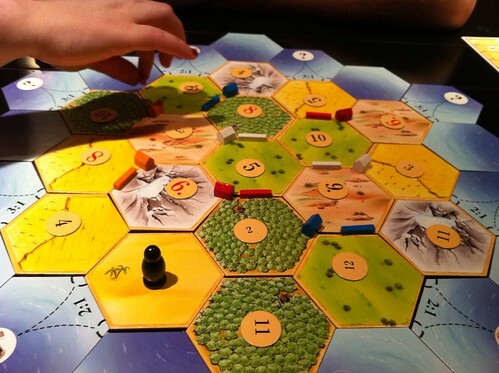 I guess that means more Settlers of Catan next week? Oh no. 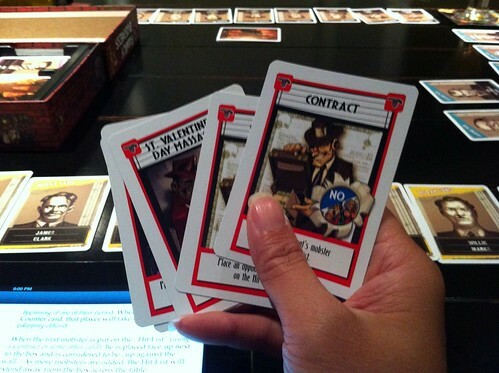 I might have to banish our copy with the Uno deck. Roast chile peppers over flame to blister and char all sides. Once charred, place peppers in paper bag to sweat for 10 minutes. 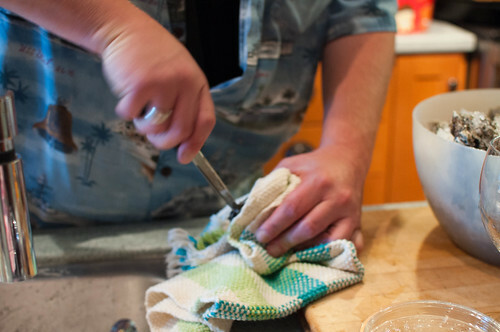 Remove the charred skin along with the stem and seeds then rinse the peppers under cold running water. Heat olive oil over medium heat. Add the garlic and onion and cook until tender. Add the chiles along with the remaining ingredients. Bring to a simmer and cook over medium-low heat for 30 minutes. Remove from heat and let set for 10 minutes to cool slightly. Place sauce in food processor or blender and puree. Hi J - Wow. TIme flies when we are busy with canine appointments. 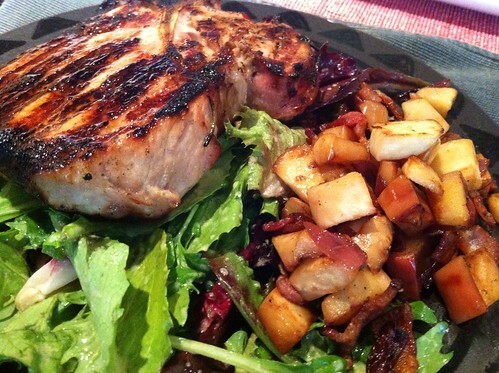 It has been two weeks since this dinner and weather has definitely turned to early fall. me: what time are you starting the grill? 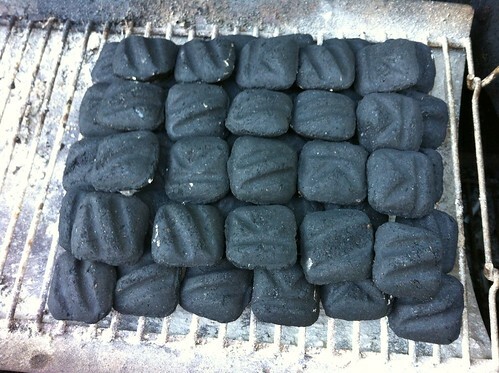 me: doesn't the charcoal take half an hour, and then resting time. And there you have it. Never mind that was an exact repeat of an earlier conversation in the morning. 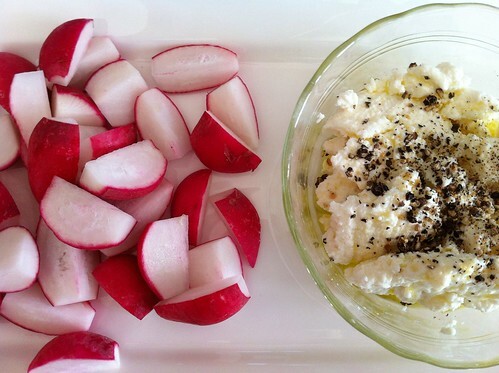 I present to you food backup plan A - radish with cheese. I found some radish in the drawer that needed a little love. I stw and selected the first recipe. I made a quick cheese, drizzled with olive oil infused with lemon zest and garlic, and ground peppers. 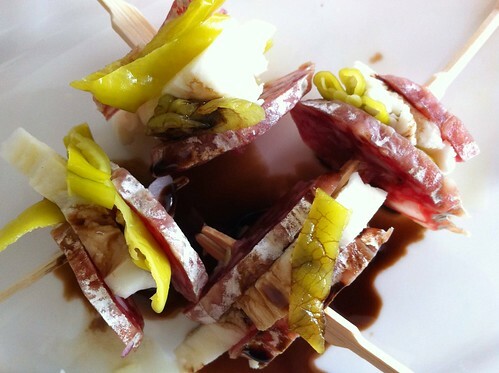 Plan B - beef tongue. Marinated thin sliced beef tongue with the usual suspect of soy sauce, rice vinegar, and gochujang. The special ingredient was yuzu wikipedia. I added some to the marinate and sprinkled more just before serving. I like the sweet tangy taste of the citrus. I did neglect to take a picture of my plate. 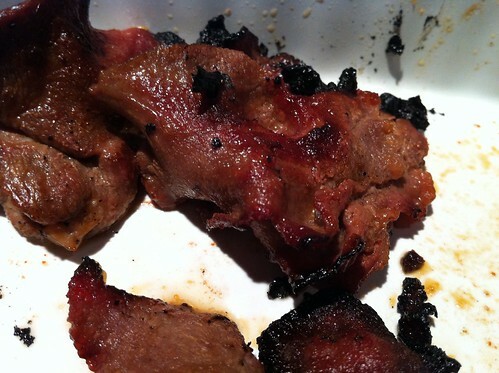 I only have a photo of the [store bought] marinated tri-top roast. 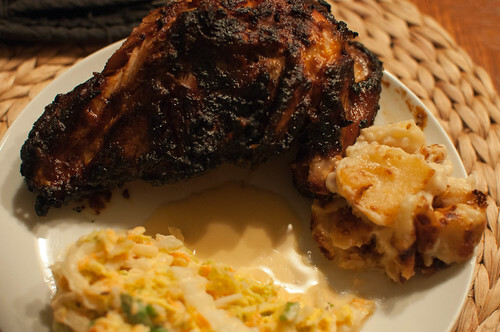 Served with [store bought] au gratin potatoes and simple romaine salad. Oh wait, I think it was scallop potatoes. Someone with more potato knowledge should explain the difference between au gratin and scallop, or read this chowhound discussion threat. 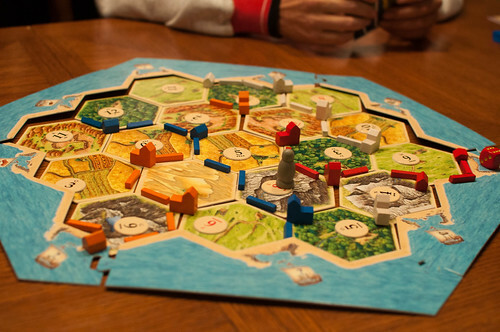 After dinner, who had the bright idea of Settlers of Catan, again? G, who also switched up the colors, which caused all kinds of issues. I think N won this one. 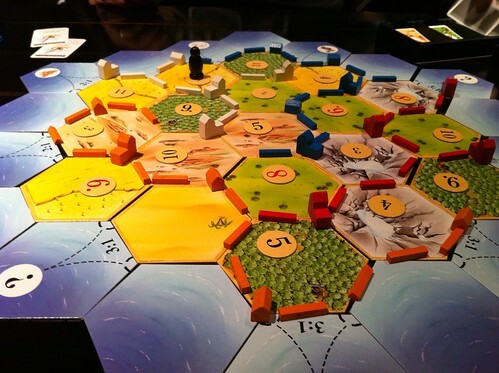 I've blocked out this six bijillionth Catan game. Hope you enjoyed the evening. See you next time. It feels like laziness when I plan a redux menu. A couple of weeks ago we were laughing at the memory of you eating thousands of mussels at dinner a few years ago. I decided we'd see if my favorite eastside fishmonger had mussels for this week. They did! Nice, fresh Penn Cove mussels. 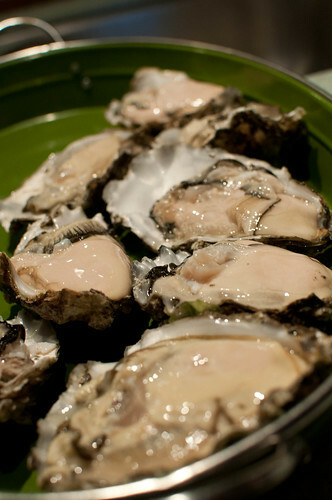 They also had a few different sizes of oysters and N picked out a few of them as well before supplementing with some very large oysters from Whole Foods. For appetizer, N did Oysters Nick, his version of Oysters Rockefeller. He tops the oysters with hot sauce (Pain is Good Batch 37 Garlic Style) and garlic butter, then tops with a bit of shredded romano and grills it. The cheese is mostly there to hold everything else together. Saturday morning I knit and flipped through a couple of cookbooks looking for a salad that would go along with mussels. 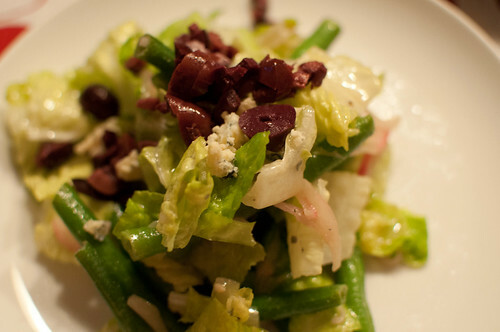 In Jasper White's The Summer Shack Cookbook I found a green bean, red onion, and blue cheese salad. 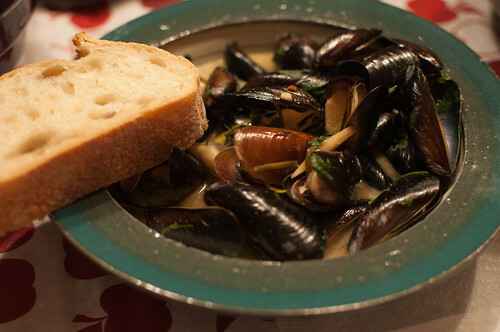 Just as he did a few years ago, N made two types of mussels: garlic butter wine mussels and Thai green curry mussels. Lots of cilantro, lemongrass, fish sauce, lime zest (we had trouble finding kaffir lime leaves-- I should just buy some the next time I see them and stash them in the freezer), shallot, garlic, coconut milk, and green curry paste for the Thai green curry mussels. This recipe looks fairly close to what N made. After dinner, you treated us to mooncakes from Regent Bakery & Cafe. 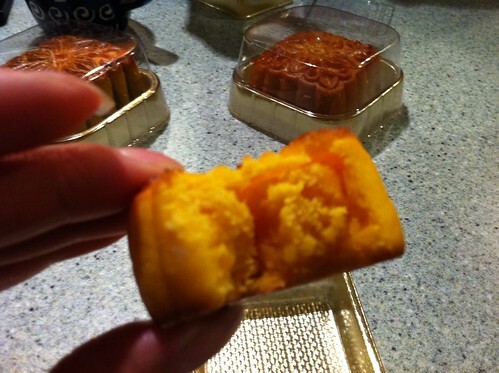 You mentioned an NPR piece about refrigeration of mooncakes -- it is both interesting and funny. Refrigerate moon cakes now, after hundreds of years of storing without refrigeration? Never. I think my favorite mooncakes were the egg custard ones, followed by the winter melon. The autumn harvest coincides with football -- the first weekend of real college football season led to the boys watching the end of the UW game while we made coffee and shared mooncakes. 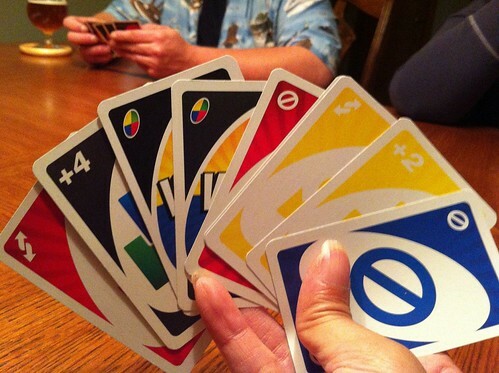 Once the football game was over, we didn't have much time left in the evening so we just played a round of Uno. I tried to convince us to play something else with no luck.